Concrete Driveway Sealer - What is the best concrete sealer for your driveway. Concrete driveway sealer is a very important part of curing and protecting a new concrete driveway as well as maintaining the integrity of an older one. What is the best concrete sealer you can use to protect your driveway from freeze/thaw damage, deicing salts, water penetration, oil, and other harmful chemical spills? I like to use a penetrating concrete sealers on driveways for a couple reasons. A penetrating sealer will actually penetrate down into the pores of the concrete and harden which actually helps strengthen the concrete it also last much longer and tends to be less slippery when wet. Unlike a film forming driveway sealer, which after applying, forms a skin on the surface of the concrete that will last for a year or two then wears off. A penetrating sealer reacts chemically with the concrete filling all the microscopic voids and solidifying the entire substrate into one solid mass. This keeps moisture, deicing salts, oil, and chemical spills from being absorbed into the concrete and eventually causing damage. When water gets absorbed into concrete and freezes it expands, if the concrete isn't properly designed or protected against this you'll start seeing surface scaling and pop-outs. Applying a penetrating cement driveway sealer will keep the water and other harmful materials from being absorbed into the pores of the concrete and on the surface so they can run off the edges. Because the concrete driveway sealant penetrates into the concrete and doesn't form a skin on the surface it isn't slippery when the driveway gets wet. It's also UV resistant and allows moisture vapor transmission. Some film-forming driveway sealers don't allow moisture to escape the concrete which leads to sealer blisters and bubbles. Once you apply a penetrating concrete driveway sealer it will be good for about 10 years. Film-forming sealers should be applied every 1 - 3 years to remain effective. The two most common methods of applying sealers to a concrete driveway are by roller or sprayer. Always refer to the manufacturer's recommended application guidelines. As a general guide, solvent-based sealers are best spray applied while water-based sealers are best applied by roller. Whether you are rolling or spray applying a concrete sealer, always strive for maximum coverage. The typical coverage rate is 250 to 300 square feet per gallon. It's best to apply two thin coats, making sure the sealer doesn't puddle or form uneven, thick areas. Once you seal your driveway, you are still committed to some regular maintenance. This usually consists of nothing more than a light pressure washing using some simple green detergent and a scrub brush, followed by a light re-application of the same sealer after waiting at least 24 hours for the concrete to dry. Before buying any driveway sealer, read the technical data sheet as well as the product label. Most suppliers will have technical data available on their websites, and it can tell you a lot about what you're getting. Key words or phrases to look for are non-yellowing, waterproofing, dust proofing, breathability and resistance to oil, grease, and acids. The product should have detailed instructions on how to apply it as well as recommendations for maintenance and re-application. If you have a colored and stamped concrete driveway click on STAMPED CONCRETE SEALERS for more information about sealing a decorative concrete driveway. Of all the sealers I have used in the last 30 years I finally found one that does what it advertises, PROTECTS THE CONCRETE AND SEALS OUT MOISTURE. RadonSeal driveway sealer penetrates the concrete and reacts chemically with the substrate to form a permanent bond, filling the pores and sealing out moisture. You don't have to re-seal every year. This is the only sealer I'll use now for my jobs. All the others I've used in the past just form a film on the surface of the concrete protecting it for a short time but eventually wearing off and requiring re-sealing. You can purchase it below, it's easy to apply, you'll be able to do it yourself with a pump up sprayer. 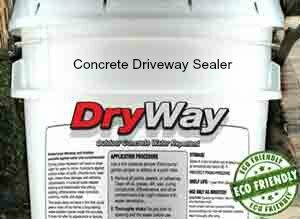 RadonSeal makes a great concrete driveway sealer called DryWay penetrating water repellent concrete sealer.